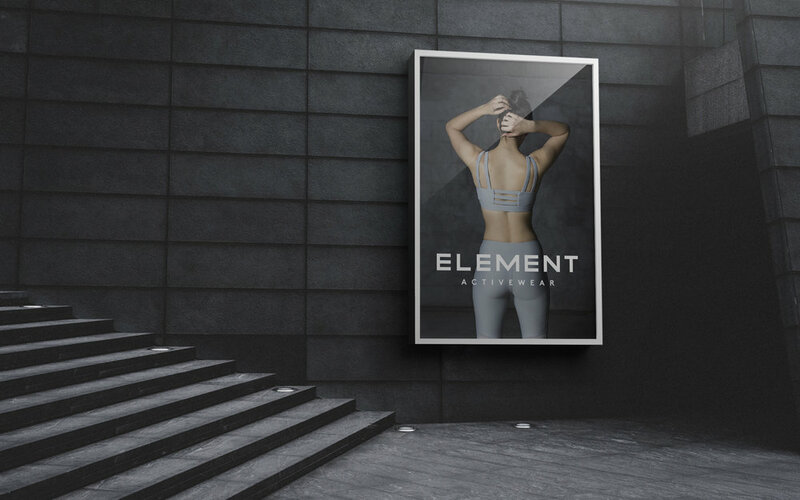 Element Activewear is a brand dedicated to providing trendy clothing that can be used on a regular basis or for working out. The project involved Branding, Creative Copy and Strategy, which was developed for brand positioning, such as developing the slogan/hashtag, "in my element," to encourage customers to use these clothes to do what they do best, be it yoga, gym or day-to-day activities. The wordmark is made out of custom letterforms which express boldness, efficiency and empowerment. The graphic symbol used throughout the brand consists of three bars (extracted from the E), representing the three elements of exercise: cardio, strength and flexibility. This works as a device for containing photography or as a reduced logo as well. The pattern, used for decorative purposes such as giftwrap, is created from the elements that form the wordmark. These letter stems, when separated, create a graphic that applies to text or images and forms a more exciting composition.